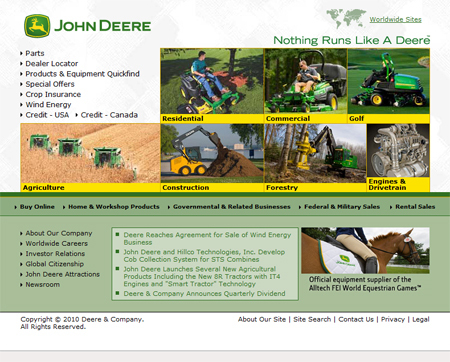 The slogan of the John Deere company, which manufactures tractors, lawnmowers, and other related equipment, has proven to be the case for numerous customers over many decades. They are the world’s largest maker of farm equipment and forestry equipment products, and among the major construction equipment manufacturers in the country, as well. John Deere Lawn Mowers are a product which they make that are not as well known to all consumers as are their legendary tractors and farm equipment. This article offers a review of their full line up of lawn mowers. To better appreciate the John Deere line up of lawn mowers available, it is helpful to begin with a brief history of the company which has grown to be the largest manufacturer of farm and forestry equipment on earth. The man who first invented the cast steel plow which was actually a commercial success, John Deere, founded Deere and company back in 1837. He incorporated the outfit in 1868 just after turning over daily operations to his son Charles Deere. The firm has prospered and expanded since that year, finally developing into the beloved and well known tractor corporation easily identified by the green and yellow colored machines. The lawn mowers made by Deere include push mowers, also known as walk behind lawn mowers, which are long on quality. They also offer tractor mowers, Select Series mowers, EZTrak series mowers and Z-Trak series lawn mowers. The JS25, which proves to be the company’s least expensive push mower, starts at only $399. It includes a Briggs and Stratton engine. This engine is 190 cubic centimeters and offers 6.75 pounds of torque. The lawn mower features a height and wheel adjuster, a Mow Mentum driving system, easily accessible controls, a stamped steel deck which discharges to the rear, and a folding and adjustable handlebar. A more upgraded model, with more features, is the JS35. It retails at around $479 and includes all of the JS25 features plus a start feature which has backup recoil. And the top of the line push mower which John Deere puts out is the JS45. In this model, the consumer gets a better OHV engine that gives 8.75 pounds of torque. It retails for $519. For any consumer who possesses a big yard, he will need a mighty tractor lawn mower. Naturally, John Deere covers all of the bases in this category. The firm’s tractor mowers are as good as they get. Deere’s first riding lawn mower proves to be the One Hundred Series, which starts with the LA105 model. This LA105 retails for $1,499. This lawn mower includes a potent 19.5 horsepower engine which comes with a full length frame of welded steel, full pressed lubrication, guaranteed never to bend front axles made of cast iron, the CargO Mounting System, headlights, a five speed shifting pattern gear transmission, translucent fuel tank including a sight gauge, comfortable station for the operator, an Edge Cutting System, and an option for Revere Implement. Other models in the series are only more and more impressive. Higher level models cost as much as $2,699. With this model, though, the consumer gets a V-Twin engine, and the price is reasonable for the features offered. The next step up in the impressive line up of John Deere Tractors is the X300 Select Series. This series starts with the X300 model. At $2,899, this lawnmower offers consumers a V-Twin, seventeen horse power engine, a three and a half gallon sized fuel tank that features a bigger opening for easy re-filling, the air cooled Deere iTorque Power System, thirty-five watt headlights, a Twin Touch transmission which is automatic, the Edge Xtra Cutting System, and a sixteen inch tight turning radius. Naturally, it offers a standard model and many other options. You are capable of upgrading all the way up to the X360 model. It will set you back $4,799, but offers hydraulic power steering and a V-Twin, twenty-two horse power engine. The X500 Select Series is next in Deere’s incredible line up. The first model in the series, the X500, sets the customer back around $5,599. It offers an iTorque Power System which is cooled by air, a V-Twin, twenty-five horsepower engine, automatic transmission which is the Twin Touch system, a five gallon sized gas tank including a bigger opening for simple re-filling, a tight twenty-two inches turning radius, traction assistance which is foot operated, and the renowned Edge Xtra Cutting System. On top of this, the X500 lawn mower offers most of the similar fine features of the previously mentioned series. The series goes up to the X540 model. It lists for $7,499. For this investment, you get a V-Twin, twenty-six horse power engine, along with “no effort required” power steering – which is power steering much like you’d find in a car. The X700 Select Series is the next step up in the Deere line up. The first in the series X700 costs a healthy $9,499. It offers buyers an internal hydraulic PTO featuring a multi-disk clutch pack, a V-Twin, twenty-three horse power engine, constant live transmission PTO with shaft drive output, an air cooled iTorque Power System, the automatic transmission which is Twin Touch, a full six and a half gallon sized gas tank with a bigger opening for simple re-filling, and of course the Edge Xtra Cutting System. All of the earlier series features are included with this line, as well. The top of this series is the X749 that retails at around $13,829 and comes with a three cylinder Yanmar diesel engine, a twenty-three horsepower engine that is liquid cooled, and a constant four wheel drive system. A group of zero-turn lawn mowers which starts with the Z225 is the EZtrak Series. These lawn mowers include a Briggs and Stratton eighteen and a half horsepower, single cylinder, engine cooled by air, caster wheel towers featuring sealed bearings and caster wheels, and a hydro gear transmission. This first model in the series runs about $2,899. The series goes up to the Z465, coming in at $5,499 and including an engine cooled by air, a Kawasaki V-Twin, twenty-five horsepower engine, and other features. The last lawn mowers in John Deere’s astonishingly varied line up include the Z-Trak Estate series. This represents yet another group of zero-turning lawn mowers, and starts with the model Z510A. This high quality lawn mower runs $6,499. It includes a drive which is hydrostatic ground, a Kohler V-Twin, twenty-two horse power, OHF engine cooled by air, and a seven gallon sized gas tank. This top-of-the-line Deere series only offers three lawn mowers. The Z520A is the next one, and it upgrades the buyer to a twenty-five horsepower engine. It retails for $7,099. Lastly, there is the Z520A, which will run you about $7,349, but does include a seven-iron lawn mowing deck which is a full sixty inches. You can clearly see that John Deere takes its lawn mower multiple lines very seriously. From affordable to ultra-luxuriant, they cover the entire spectrum of cutting your lawn. For anyone who is truly serious about well maintaining a lawn and garden, a Deere lawn mower makes a smart consideration. I have a repacement part that is worthless. The replacement part was to replace a poorly designed part that failed in use. I have a l110 deere lawn tractor with a 42 inch cutting attatchment. No serial # on the cutting deck . The mounting bracket, welded to the frame failed in use and warped the large idler pulley when it broke. The replacement part. the mounting bracket for the idler pulley was installed,but thepulley will not work because the edge of the puley binds on the bracket when installed and will not rotate.. The dealer Keil equipment,was of no help with this problem. I believe a depth washer might solve the problem.I can not find one. The agent on the offered phone number was most intransigent. \I would hesitate having one of my attorneys pursue this matter and it has also been suggested a net flood of the problems encountered. I used my lawnmover all day and went to put it away. It won’t start. I get a code 1 & 2 but keep trying to release and step on the break to no avail. Any idea what could be the problem.